Founded in 1774, Newark Academy is one of the nation's oldest and most highly regarded independent secondary schools. Originally on the corner of Broad & Academy Streets. Moved to 544 High Street in 1857, occupying the building of the Newark Wesleyan Institute. In 1929, the school moved to a new red brick & limestone building at the corner of North First Street & Seventh Avenue. In 1964, the Academy moved from the city of Newark to its 68-acre campus in suburban Livingston. A co-ed school for grades 6-12, the Newark Academy student body is comprised of 540 students from north-central New Jersey and from around the world. In fact, the Newark Academy school community is among the most diverse in the United States. The curriculum offers opportunities in 23 Advanced Placement subjects, and Newark Academy remains the only independent school in New Jersey authorized to offer the prestigious International Baccalaureate Diploma. This comprehensive, rigorous two-year program for 11th and 12th graders is recognized by top universities around the U.S. and the world as the standard of excellence among all secondary school academic programs. The Newark Academy was incorporated in June, 1795 and re-chartered in March, 1855. It affords a common, high school and academic education under a faculty of high attainments, and has been famous for a hundred years for its efficiency and high standing. The building, at the corner of High and William Streets is pleasantly situated on an eminence overlooking the lower part of the city and from its roof a fine view of the country for many miles in extent can be obtained. It is a graded school divided into departments and subdivided into classes. Beginning with children who are learning to read, the institution carries them through a thorough course of common school education, prepares them for college, graduates them as civil engineers or fits them for commercial life. It is amply furnished with astronomical instruments, chemical and philosophical apparatus and other facilities for pursuing a liberal course of studies. First building erected prior to 1775 at south end of Washington Park, nearly opposite end of Halsey Street: destroyed by British soldiers 1780 and never rebuilt. 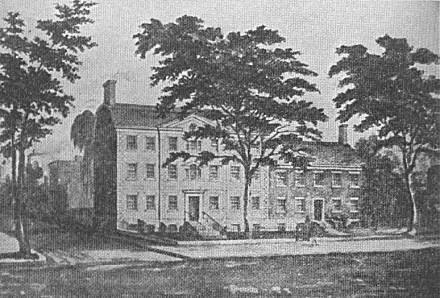 First building of present Newark Academy erected 1792, north corner Broad & Academy Streets; site now occupied by Post Office. Property at High and William Streets, now occupied, purchased 1857.